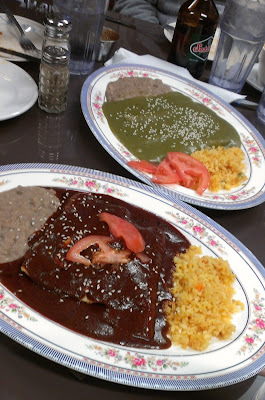 Denver on a Spit: A Denver Food Blog: A Night of Unforgettable Enchiladas: Is Tarasco's My Favorite Mexican Restaurant in Denver? 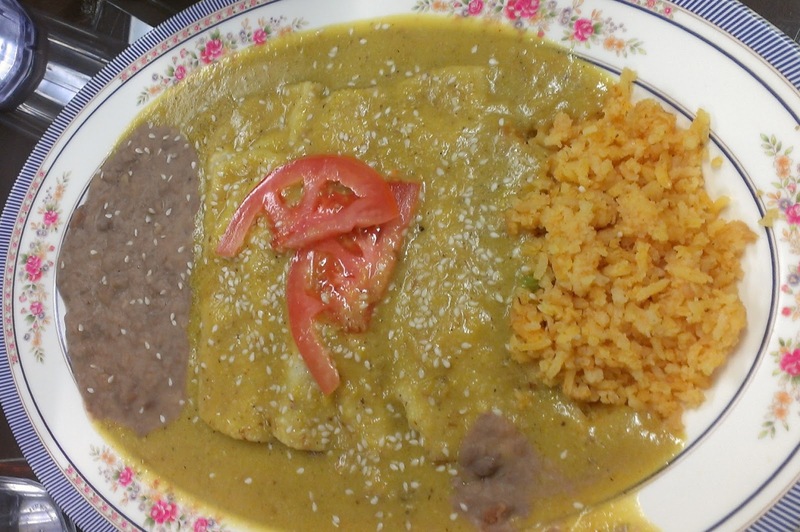 A Night of Unforgettable Enchiladas: Is Tarasco's My Favorite Mexican Restaurant in Denver? A couple of months ago my wife asked me where I would like to have my birthday dinner. Table 6? Frasca? Insert fancy restaurant name here? Almost without hesitation I blurted out: Tarasco's. She laughed a little but understood, and proceeded to secretly call the owner to try and set up a surprise private birthday tasting menu, and make sure they would have enough room in their small dining room for us and eight or ten of our friends. When he kept speaking to her in English, she told him she was from Mexico as well. "Oh," he told her, "Only Americanos call to ask questions and make reservations. Just come in and and we'll set you up." 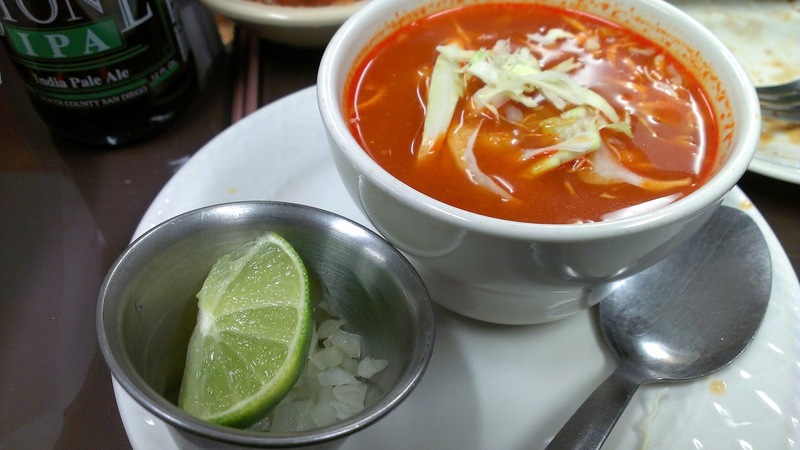 If you don't already know, Tarasco's is owned and run by young and affable Noe, a native of Michoacan, a place rich in culinary tradition and well-known for its mole. Tarasco's has, without a doubt the best assortment of moles I have tried in Denver-- and while I can't say for sure they are the best in town, they are good enough that I have stopped looking elsewhere. We were seated in the middle of the small and homey dining room. My lovely wife quickly negotiated the first courses that started with a cup of Tarasca soup, a typical dish from Michoacan made with a base of beans, cream and tomatoes, but with a smoky depth, hint of heat and crisp freshness unlike anything I've had in a long time. An amazing way to start what would be an unforgettable feast. Next was a very good cup of red pozole. It lacked the goodness and rich flavor that comes from a slow-cooked pigs head like the best of Mexico City's pozoles, but it was good nonetheless. Our next plate was a quartet of grilled nopales, of course. My wife is enamored with this hard-to-find-done-right-outside-of-Mexico dish, and the Tarasco's version is indeed stellar. It was polished off in no time and served as a nice build-up for what was to come. Here is where the night gets a little hazy. After the nopal plates were cleared, a flurry of enchiladas poured through our table. I'm not sure I even captured all of them on film, but needless to say each one was uniquely exquisite. Let's say we started with the mole verde and the mole siete chiles. I have had both of those before at Tarasco's, though in previous visits it was always poured over a plate of luscious carnitas. Can't say I necessarily prefer the enchilada version more, but the tortilla does provide optimal soaking of the delicious sauce and I even made a couple tacos filled with nothing but the mole when nothing else was left. Incredible. The mole amarillo was a special that night and again was unique and divine. 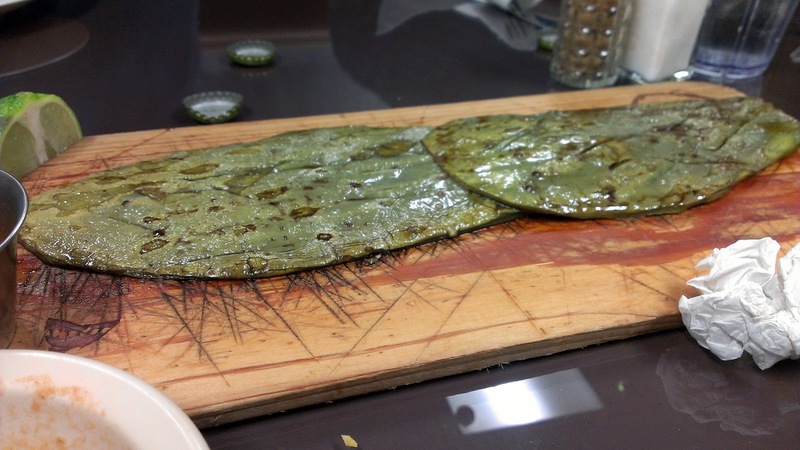 I believe it gets its color from corn masa and tomatillos, but its taste is layered and complex. 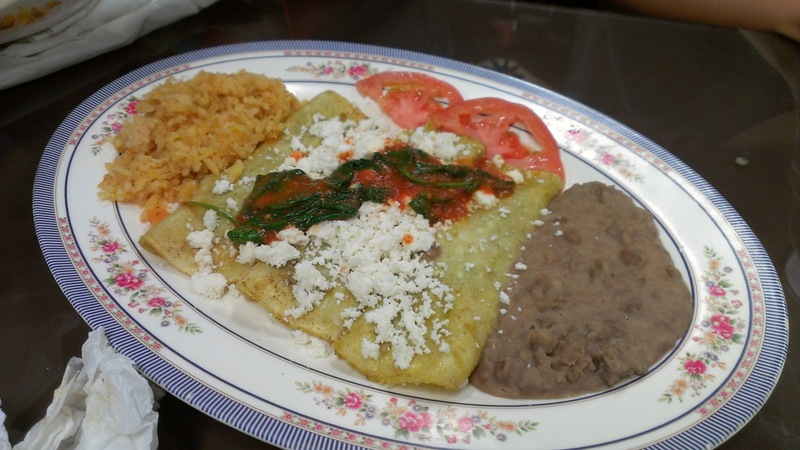 Many moons ago I posted a recipe for enchiladas mineras, a delicious regional specialty of Guanajuato. I wondered aloud in that post if anyone in Denver made them. Now I know. It so happens that one of the cooks is from Guanajuato, so it is with this stroke of luck that they have arrived in Denver on a menu somewhere. If you still haven't tried them, now would be a good time. The tortillas are soaked in a guajillo-based sauce and the filling includes carrots and potatoes. I make mine with chicken as well, but this simple, common version was every bit as delicious without the meat. I think my favorite dish of the night came last. 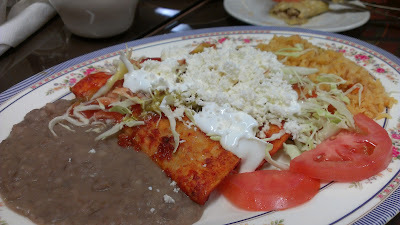 It was an extraordinarily simple plate of enchiladas de espinacas. 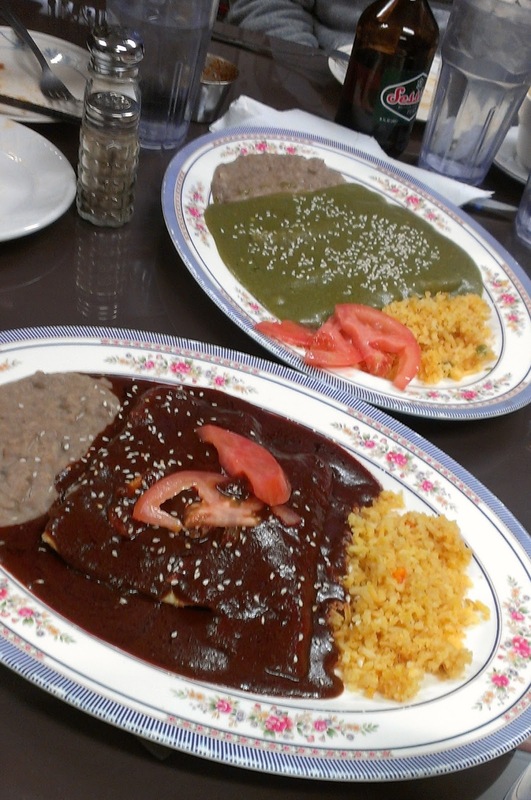 The sauteed spinach drenched in red chile sauce matched perfectly with the crumbled, sharp cotija. The tortillas were soft, dipped in a green salsa and stuffed with more of that excellent--and I mean excellent as in perfect--spinach. 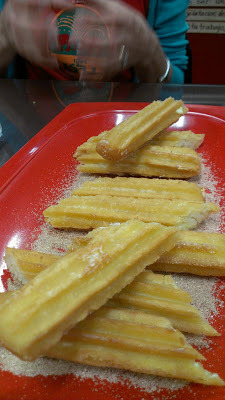 We finished our meal with flan, lovely sweet corn tamales, and a beautiful, tear-jerking spread of churros. 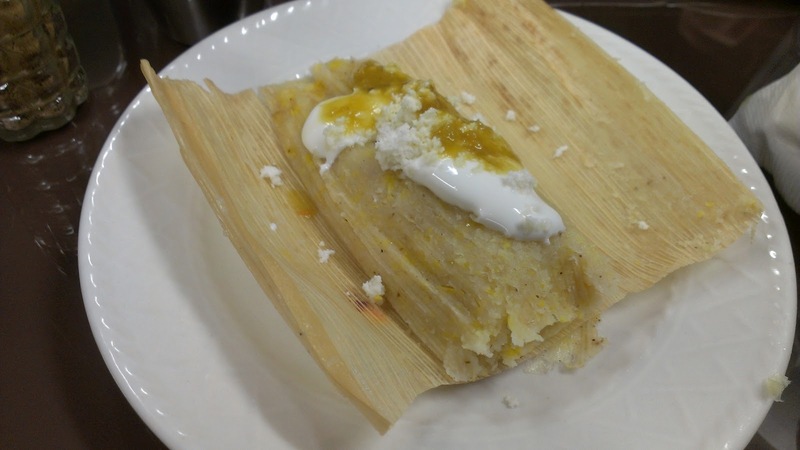 The flan was delightful, as was the tamal. In my younger days I could have eaten tamal, flan and the entire plate of churros. But alas, we were here with others, which meant sharing food. I think a few months ago I said something stupid (ok, I do that every week) about how hard it was to find a good plate of churros in this town. I had completely forgotten about Tarasco's. Now I don't have to worry about overpaying for my churro-fix either. This was the type of meal where you become sad that the human body has evolved to feel fullness. I could have happily kept eating for the pure pleasure of those delicately balanced flavors dancing on my tongue. But alas the too-slow peristaltic process of digestion signaled the end of yet another meal--but what a meal it was. People frequently ask me what my favorite Mexican restaurant is. It is such a hard question to answer, in part because what, in the end, is Mexican food in the United States anyway? It can mean so many different things. There is so much to consider and I like the whole gamut, from the green chile smothered, yellow-cheese-topped burritos to a parrillada de pescado to a delicate Oaxacan mole. That being said, if I don't consider taquerias, I must admit that Tarasco's is my first choice for a good spread of Mexican food. And until I come across something better, I am going to say it: Tarasco's is my favorite Mexican restaurant in Denver. Just got back from lunch at Tarasco's with my family. We'd been before, but your post reminded me it had been too long. I got the bean soup and spinach enchiladas per your recommendation; my husband got nachos and an amazing, massive torta; my kids got rice and beans and quesadillas and a mango, pineapple and orange smoothie; and we all shared an order of guacamole. Everything was amazing. I've never posted here, but I love your blog - thanks!! Glad it reminded you to go back. I neglected to mention the great liquado selection they have this time. I'm starting to think that EVERYTHING they do is amazing. thanks for reading. 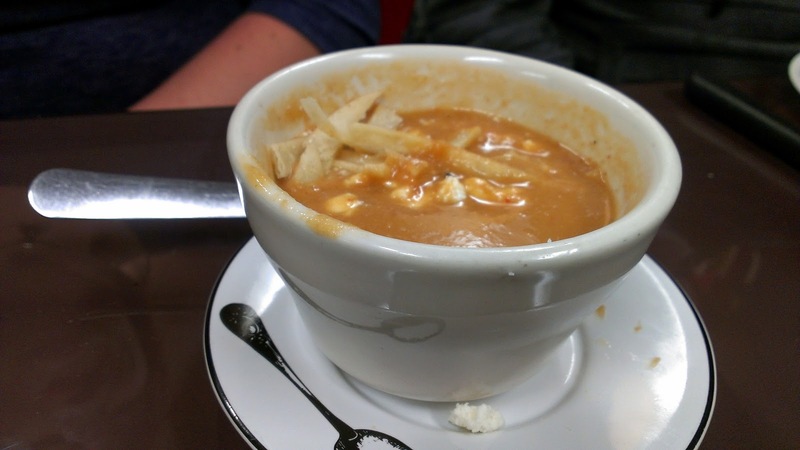 Looking for something way better than average and different in Mexican food? This is the place; don't let the exterior or ambiance fool you. They have the tropical fruit drinks which are recommended as some of their salsas and sauces have the low slow burn. Everything is delicious and the service is top notch. FYI, I got the mole amarillo for the first time this past weekend, and it's by far my favorite of the three moles - amazing.